Come Ride Rodgers & Hammerstein’s Wonderful, Rousing Revival of “Carousel” on Bway! “Come ride away with me! And I will take you to heights you never dreamed of! 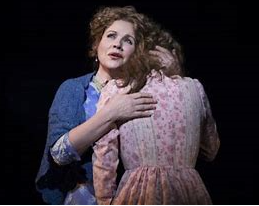 ” beckons the plaintive/beautiful “Carousel Waltz” that opens Rodgers and Hammerstein’s classic “Carousel” now being magnificently revived on Broadway, directed masterfully by Jack O’Brien. 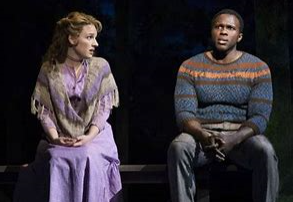 It stars, as the star-crossed lovers Julie Jordan and Billy Bigelow, Jessie Mueller (“Beautiful”) and Joshua Henry(“The Scottsboro Boys”). And “Carousel” is sounding more blissfully like an opera than ever. with the largest, most opulently orchestrated orchestra (with a harp even!) I’ve ever heard on Broadway! Orchestrations by the great Jonathan Tunick and Musical Supervision by Andy Einhorn. You can’t miss this one! All you musical theatre romantics out there!. It will make you cry from the first chords of the wordless, long, lush overture that opens with the “Carousel Waltz ” as Santo Loquasto’s glittering cup-cake-like tiara of a shimmering crown descends to represent the top of this dizzying merry-go round, as Tony-winning choreographer, Justin Peck keeps his dancers flying, spinning through the air. You MUST ride their joyous Carousel with all these wonderful artists on it! It’s a joy ride of a revival that surprises and startles and blows you away over and over again. especially musically. Particularly if you think this is an over-familiar chestnut of a score that has no surprises left to find. You’ll never be able to forget the sounds this magical musical makes..
As perfectly classical as this “Carousel” is in every respect, it is breaking ground thoroughly too with its casting of African-American Joshua Henry, who proves beyond a doubt that he is one of the best great baritones Broadway now has, but that also director Jack O’Brien’s color-blind casting gives this masterpiece even more depth and timeliness that it’s ever had. 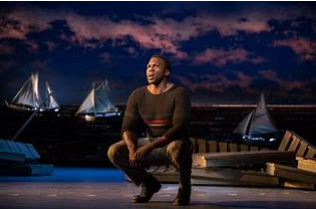 Joshua Henry’s reluctant wooing of white Jessie Mueller seems a perfect match, and gives credence to the other small town New Englanders giving vent to their small-town New England prejudicial warnings to Julie Jordan(Mueller). Their constant put-downs of Billy Bigelow(Henry) now seems justified from the 19th century point of view. It reminds us that their admonishments of an inter-racial romance’s “ending will be sad” prove true as the (spoiler alert) Second Act turns tragic. Billy never thinks he’s good enough for Julie and events bare him out. Joshua Henry brings down the house with a rage-full “Soliloquy,” turning it more powerfully dark than I’ve ever remembered it. When he sings he doesn’t want his unborn daughter “to be dragged up in slums with a lot of bums like me,” it is coming from a place of pain that Rodgers and Hammerstein never envisioned. And Jessie Mueller is a revelation too, singing in a sweet coloratura soprano that we’ve never heard her use before. She’s always been a Broadway belting baby utilizing her killer voice in the lower veiled registers. She now shows that her vocal and emotional range is limitless. She also doesn’t shy away from the passion Julie is feeling that propels her to Billy. “What’s the Use of Wond’ring” which is often just a throw away, here becomes a life lesson. It is foreshadowing as she is joined in its sad, resigned tones as Mueller proves to be a true relation of Renee Fleming, who joins her in the song and agrees with her. And then on Billy’s horrifying death, a bloody one this time, when Fleming tells Mueller over Billy’s dying body “You’ll Never Walk Alone,” she shakes the heavens as well as the rafters with the celestial perfection of her legendarily, thrilling voice. My only disappointment, and it was a big one, was that Tony Winner Lindsey Mendes was out the night I saw it. She was replaced by a very bland, super-white, uptight college girl, which is not what Carrie Pipperidge’s character is supposed to be at all. I disliked her so much I won’t even mention her name. And SHE won the Tony? In THAT part? Ms. Mendes must’ve been terrific, because the massive achievements of Joshua Henry, Jessie Mueller and Renee Fleming were world-class, unforgettable. The excited audience applauded everything. The opening carousel appearance, and stopped almost every single number with rounds of applause also, WITHIN the song. I’ve never seen anything like it. And last but not lost, Method Actress Margaret Colin proves that tasty, tacky, businesswoman/owner of the carousel, Mrs. Mullins demands and commands every single second of her stage time. She makes one wish she had more to do and even makes you think that SHE should have had a rousing song, too. I’ve never seen a “Carousel” with such a strong Mrs.Mullins. In Ann Roth’s flouncy, bouncy costumes, Colin’s virago becomes a diva. I could see this “Carousel” over and over and over again, and I can’t wait til the next time I do!